SAN DIEGO — When Urban Miyares was a young boy, he dreamed of sailing around the world. His entry in the 2013 Transpacific Yacht Race — a 2,225-mile ocean adventure — puts him just a little closer to accomplishing his goal. In July, Miyares and David Hopkins will race against some of the world’s most famous sailors — and some of the largest and fastest boats — in a transpacific crossing. The race starts off Point Fermin in Los Angeles and ends off Diamond Head, east of Honolulu. Together, the vets will shatter the concept that the race is impossible or too challenging for sailors with disabilities to complete. Sailing in the race allows the two to live the mission that Miyares’ organization is founded on: making dreams a reality. “It’s been one of my dreams to sail around the world, so this is a preliminary for me — to see if I really can do it,” said Miyares, co-founder of Challenged America, a therapeutic sailing organization founded in 1987. 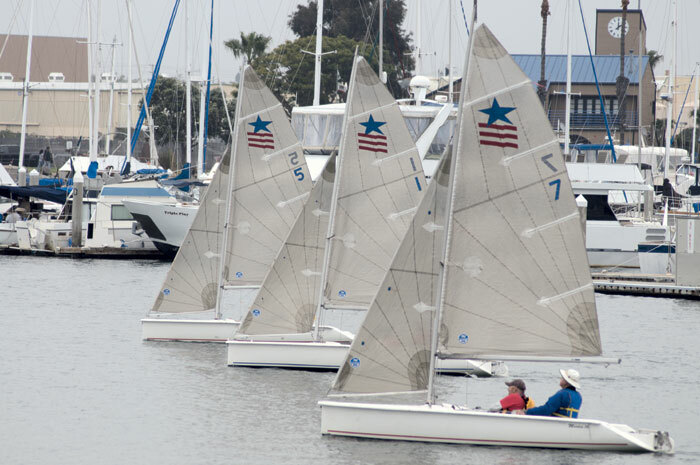 Based at San Diego’s Harbor Island, Challenged America offers year-round no-charge learn-to-sail opportunities for children, adults and veterans with disabilities. The organization uses sailing to help disabled sailors build self-confidence, develop new skills and abilities and stimulate independence. In 2003 and 2005, Miyares competed in Transpac with Team Challenged America. This will be his first time competing double-handed: a new and welcome challenge for the San Diego resident. Miyares, a blind and multidisabled Vietnam veteran; and Hopkins, a Navy veteran with a service-related hearing impairment, aim to finish the race in 12 days. Challenged America sailed on B’Quest during the 2003 and 2005 Transpac, completing the race in 13 days. B’Quest has been hauled out at Shelter Island Boatyard, where it is undergoing major modifications in preparation for race day. The vessel will be “slimmed down,” with a telescoping bowsprit, and roller-furling and asymmetrical sails and rigging installed. Challenged America is attempting to procure a larger vessel donation, so that more disabled sailors can compete in next year’s race. Until then, Miyares and Hopkins serve as inspiration for others. For more information, or to sponsor Team Challenged America in the 2013 Transpac Race, contact Urban Miyares or David Hopkins at Challenged America, 955 Harbor Island Drive, Suite 130, San Diego; (619) 523-9318; email ahoy@challengedamerica.org. For more information, visit challengedamerica.org.